Fourth Row Center: Film Writings by Jason Bailey: In Theaters: "Nuremberg"
The story behind Nuremberg is more interesting than much of what is on screen, and that’s the rub. The film—officially titled Nuremberg: Its Lesson For Today—was the U.S. government’s official document of the International Military Tribunal in Nuremberg, which lasted nearly a full year between 1945 and 1946. 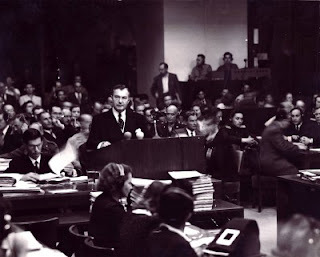 Twenty-five hours of courtroom footage was shot by government photographers, and footage (screened during the trial) was included of the atrocities of the war—both from the Nazis’ own archives, and U.S. Office of Strategic Services (OSS) Field Photographic Branch. Stuart Schulberg (brother of the legendary screenwriter and novelist Budd Schulberg, who also worked on the film) wrote and directed the documentary, which was distributed in Germany in 1948 and 1949. But it was never released in America; a planned theatrical run was scrapped, and in the ensuing years, the original negative and sound elements were lost or destroyed. This new restoration, supervised by Schulberg’s daughter Sandra and Josh Waletzky, reassembles the film as it was originally presented, reconstructing the score and re-recording the narration (voiced here by Live Schreiber). From an archaeological point of view, this was probably the wise and responsible decision. But it does not make for the most compelling documentary. The problem with Nuremberg, as it exists now, is simple: a substantial portion of its 80-minute running time is spent on a painstakingly detailed military and political history of the Third Reich. This long middle stretch is informative, yes, but its inclusion is a harsh reminder that we’re watching a sixty-plus year old documentary; this information may have been fresh and enlightening in 1948, but for today’s audience, the entire middle section of the movie is the kind of thing they can see (done better) any night of the week on the History Channel. The elements of the film that pique our interest—how it was made and why it was, for so long, suppressed—are addressed nowhere, and this is the picture’s fatal flaw, and its missed opportunity. Recent efforts like A Film Unfinished and Harlan: In the Shadow of Jew Süss have (fascinatingly) examined cinematic artifacts of the Nazis through a modern microscope, not only placing those films into an exploratory context, but indulging in some engrossing onscreen detective work. Such an approach would have done a greater service to Nuremberg than the straightforward reconstruction that we have here. This is, of course, not to say that there isn’t much of value in it. The courtroom footage and accompanying audio is of tremendous historical value, from the opening accusations (and close-ups of the war criminals) to the genuinely rousing and justifiably incredulous closing statements. The narration is smart and succinct (“Hitler had said, ‘Today Germany, tomorrow the world’… and this was tomorrow”). And the footage of terrorization and liquidation of the Jewish people is affecting and expectedly horrifying. An early scene of people literally eating out of trashcans, scraping from the lids even, is difficult to watch; worse is the shocking footage of an early gassing experiment. The destruction in the wake of the Nazis stuns—piles of shoes, piles of clothes, piles of bodies, skin and bone corpses being dragged into mass graves. These are painful and powerful shots. There is enough of Nuremberg that is potent and shocking that the long slog through the stock background information stands out as even more of a waste. It’s such a short film, with so many unanswered questions and so much that we haven’t seen, that it seems a shame to spend so much time on such familiar material. It’s an important document, no doubt. I just wanted more out of it. "Nuremberg" opens today in limited release.